For years I have described strongholds to people using a brick illustration. Strongholds are built one brick at a time. Every time we chose the wrong way, or allow our feelings and emotions to dictate our path, one brick gets added. As we continue to make unrighteous or idolatrous choices over and over again, bricks keep getting added around us until finally we find ourselves enclosed in a brick cocoon, feeling trapped and unable to be free. I go on to explain that every choice, every decision we make we either add a brick (idolatry) or we remove a brick (victory) from the cocoon, the stronghold. Breaking free of the stronghold requires right choices despite our feelings and history, over and over and over again until all the bricks are removed. I hope you are able to track my illustration because it gives a good picture of the role we play in developing strongholds. I believe people have been helped to understand in a practical way how to stop building an idolatrous stronghold. One day, not too long ago, I was reading Psalms and once again read: Psalm 27:1 The LORD is my light and my salvation; whom shall I fear? The LORD is the stronghold of my life; of whom shall I be afraid? This thought occurred to me: I have often used the brick illustration to help people understand how an idolatrous stronghold develops but I’m not sure I ever described how the right kind of stronghold is developed. The LORD is the stronghold of my life… pause a moment. How would those bricks be used redemptively to build a glorious godly stronghold that will withstand any and every onslaught of the enemy? Basically the same way. Every time we think and respond in truth in a situation, we add a brick. 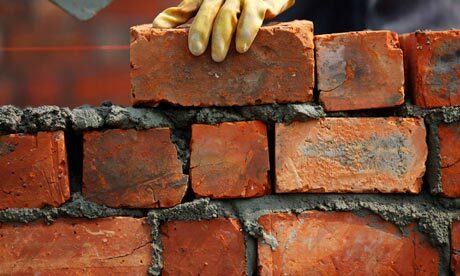 Every time we consider Scripture and allow it to inform our attitudes and actions we add a brick. Every time we choose Jesus over the world, we add a brick. Every time we chose forgiveness over bitterness, we add a brick to the right stronghold. Every time we choose kindness over harshness, we add a brick. Every time we choose silence over gossip, we add a brick. Every time we choose self-control over gluttony, we add a brick. Every time we choose love over apathy or hatred, we add a brick. Consistently choosing truth over lies creates a godly stronghold of protection. The LORD is the stronghold of my life. What do I have to fear? NOTHING. Rest in that simple truth today. Diane Hunt – After serving 16 years full time on the staff of America’s Keswick, Diane and her husband moved to North Carolina where she continues to serve part time as a contributing writer and Partner Care Consultant. She is also a biblical counselor and women’s event speaker. For more information about having Diane speak at your next event please contact her at dhunt@americaskeswick.org. I just have to tell you what a blessing you are. I can always tell when a Post is yours. You are so insightful, write so clearly and make it so easy to understand a Godly principle, and are very spirit filled. I share your Posts with my family and friends. Thank you so very much. Your posts are very helpful in walking with the Lord. May the good Lord bless and keep you always!